Manchester City are on the brink of winning the Premier League title after ending their troubled spell with a stylish 3-1 win over Tottenham Hotspur on Saturday. Pep Guardiola’s side extended their lead over second-placed Manchester United to 16 points thanks to goals from Gabriel Jesus, Ilkay Gundogan and Raheem Sterling at Wembley. Fourth-placed Tottenham were powerless to halt City’s revival and a first defeat in 14 league matches shouldn’t ruin their bid to qualify for the Champions League. City’s hellish week had Guardiola warning his players that “anything can happen” as he recalled other great sporting collapses from seemingly invincible positions. Leroy Sane met Sterling’s cross with a searing volley that cannoned off a post with Tottenham goalkeeper Hugo Lloris rooted to the spot. 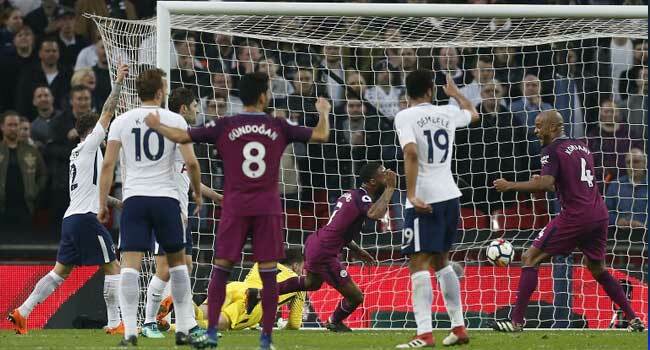 Unusually sluggish, Tottenham weren’t testing City and, with a swagger back in their stride, Guardiola’s men took the lead in the 22nd minute. In the week Premier League clubs voted not to introduce the Video Assistant Referee system next season, this was a moment when the controversial replay technology would have been useful. Tottenham defender Ben Davies somehow escaped a red card for a horrible studs-up foul on Kompany, but the leaders still had a soft centre to their defence. Harry Kane was lampooned in some quarters for making what was perceived as a slightly greedy, if successful, appeal to have Tottenham’s second goal at Stoke last weekend credited to him instead of Eriksen. Kane at least returned the favour as Eriksen scored in the 42nd minute. Running onto Kane’s defence-splitting pass, Eriksen’s shot hit City’s Aymeric Laporte and deflected back onto the Tottenham midfielder on its way past Ederson.